MediaConcepts understands the complexity of balancing the diverse needs of the corporate office with those of multiple properties around the world. This is why we developed Jasmine WebSuite – a digital platform centred on a content management system, supported by complementary modules that come together to create a customised solution for each client. 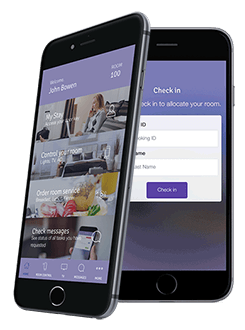 An extension of Jasmine WebSuite is Priscilla, a mobile concierge that will build guest satisfaction, increase on-property spend and improve operational efficiency. Our core expertise lies in translating your business challenges and goals into digital user experiences, built on solid technological foundation, hospitality knowledge and creativity. 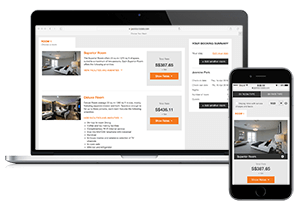 Our web designers and developers have a wealth of experience and knowledge working on hotel websites. Employing best practices based on Persuasion, Emotion and Trust (PETTM design by Human Factors International), we take your business requirements and turn them into a digital representation of your brand. We are also adept at integrating complex systems and third party tools to create a seamless experience for your users. You have full control over how your website looks and behaves, so why shouldn’t you have the same control over your most important booking channel? Whether it’s managing complex business logic or integrating into business systems and payment gateways, there is no challenge too big for our team to undertake. That is how we’ve come to gain our depth of knowledge over the years and are able to shorten our development time so you can start generating revenue quicker. E-Consultancy’s research shows that companies that personalise their web experience see, on average, a 19% uplift in sales. 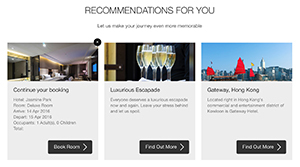 While online retailers are fairly advanced in the use of personalisation, the hotel industry is just starting. At MediaConcepts, we strongly believe in using personalisation at every touch point and can work with you to make recommendations for your website, booking and beyond. MediaConcepts sees every client relationship as a long-term commitment. In addition to developing customised digital solutions to meet your current business goals, we offer consultative services and strategic guidance and recommendations that enrich guest experience, increase retention and improve profitability. We also offer a fully managed hosting service if you prefer not to invest in resources to house and support servers to store your data.